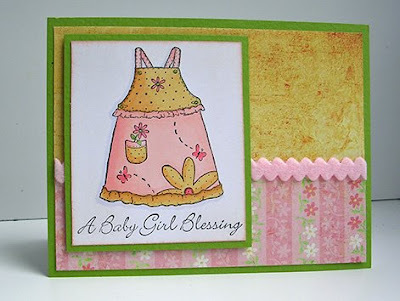 I needed a new baby card for one of the women at my church. 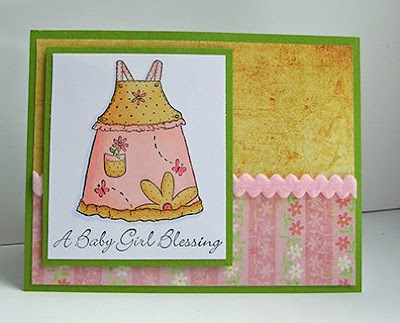 I decided to use the super cute Baby Blessings set from Impression Obsession. The set has a little boy outfit and a little girl dress - and the two sentiments. Cute, cute, cute! I pulled out my Basic Grey Oh Baby paper (I still love that line) to select the colors to use in the image. I decided to accent the blue and orange with just a little green. I mounted the patterned paper on an orange piece that I scored at top and bottom to add a little accent. The image is colored with Copics. I also used a duster brush to add color to the edge of the white paper with my image. In this case, I used Distress Ink in dried Marigold. Its pretty simple, you just lay your image on scrap paper and ink up your brush with the desired color. 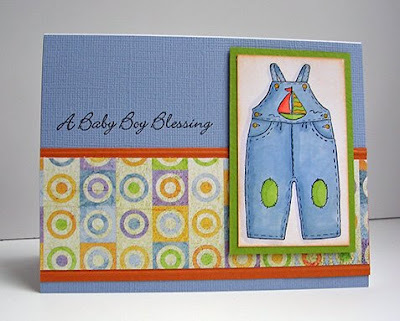 I usually either use Distress Vintage Photo just to soften and antique edges, or I choose a color that coordinates with the card to pull everything together. I tap my brush on the scrap to get a little of the ink off, then I sweep the brush, starting off the image cardstock and brushing over the paper edge toward the center. This will give you a darker color at the paper edge and very light or no color in the center. Just keep turning your image and sweeping the color until you go all the way around. Re-ink and tap off excess as necessary. It only takes a few seconds - but I think it really adds a lot to coordinate a card. I tried to show you the difference between "dusted" and "undusted" in the following cards. It is one of those things that show up much better in person - but maybe you can get the idea. This card has the white undusted. This card has the white dusted with Tattered Rose Distress Ink. The inked brush can be dusted across textured papers to highlight texture. It can also be used to create "sky" or "grass". Just mask your image and dust the ink over the background. The more you dust, the darker the color. Its very easy to control. Since I ran out of "air" for my Copic air gun - I have been using this technique. You can use any ink with this - I like the Distress inks and probably use them the most, but I tried it with the new Mementos yesterday and they worked great. I've also used it with the VersaMagic inks. 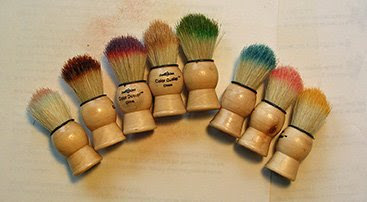 The duster brushes are available in The Paper Garden Projects Store (as well as inks of course). One thing though, I have read that you should not submerge the brush in water. Its OK to get the bristle tips wet, but don't submerge the whole brush. I just have a brush for each color family. So I can just grab it and use it. Sorry - a bit long winded. But these are one of my favorite little tools - so much more fun than dusting furniture! Thanks for stopping by, have a great Monday. these cards are wonderful, what great stamps. I have used chalk in the past but really like your technique, will have to give it a try. I have never used those duster brushes before, might have to get some. 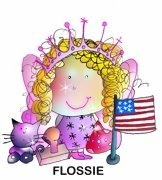 Love this stamp set, especially the overalls, too cute! Great job as always on the cards. These cards are adorable. I have never used duster brushes before but I like the effect. The stamps are so cute. Your cards are wonderful. I really love the overall one. Dusters are great. I clean mine on baby wipes after I destroyed one by washing it. The brush part came loose from the handle. These cards are so cute! Those images are just adorable. THe dusters look like fun! I might have to pick some of those up...I like a change from just sponging.